Bay Metals & Fabrication delivers excellence through quality, meticulous workmanship in marine and industrial repairs and fabrication. Whether the client is the U.S. Navy or a commercial entity, our family of skilled tradespeople hold a reputation on the waterfront for producing dedicated, disciplined work. We bring more than 30 years’ experience in Hull, Mechanical and Electrical (HM&E) services. Quality begins at the top, with safety-conscious, driven leaders, guiding each project from start to finish. Based near the Port of Hampton Roads, Virginia, our dependable workforce provides turnaround services for customers locally, nationally and across the globe. We are looking for individuals experienced in the ship repair and craft trades, including: Pipe Fitters, Sheet Metal Workers, Painters, Electricians, Welders, & Ship Fitters. Bay Metals & Fabrication takes pride in recruiting and retaining an exceptional workforce. We provide a safe workplace where each employee is given the opportunity to grow through training, personal involvement and purpose-driven work. We are adept at performing over 40 procedures in carbon steel, stainless steel, copper nickel, monel and aluminum welding. Our personnel hold certifications for aluminum, stainless, carbon steel, HY-80, HY-100, copper nickel, and many more. Quality Assurance (QA) is paramount to every operation we engage in. Our focus remains the same-delivering the highest quality product to our customer by implementing proven Quality Assurance processes and procedures in all applications. MF&B has experience in sheet metal design, fabrication, assembly and installation using a variety of metals. Our tradespeople possess expertise in ventilation fabrication, bulkhead/partition work, brackets and covers, sheetmetal cabinets, bunks and habitability furniture. With experience designing and installing various high pressure and low pressure piping systems, MF&B is well-postured to complete shipboard and commercial applications. Our personnel are able to work locally, nationally and internationally. At MF&B Marine, safety is at the heart of every project. Our leaders implement safety procedures daily to minimize accidents while maximizing time. A detailed, thorough approach ensures a safe workplace and happy customers. A highly-skilled staff at MF&B Marine possess the skills necessary to perform a wide range of Hull, Mechanical & Electrical (HM&E) services for naval and commercial ships. 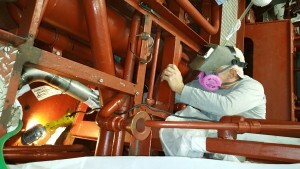 We fabricate, install, repair and modernize marine and industrial components. Our shop is equipped to perform machining jobs from fabrication and assembly to installation and testing of metal ship components on or off-site. The MF&B team has experience in milling, lathing, drilling, specialty cutting, repairs and modifications. We perform complete habitability services to include rip-out of existing quarters and replacement with upgraded components. MF&B fabricates and installs berthings, galleys, mess decks, offices, and machined cabinetry. We offer a comprehensive range of fabrication & installation services in the ship and marine industries, to include foundations, piping, mechanical, habitability, ventilation, as well as upgrade capabilities for combat, machinery controls and ship IBNS and GEDMs. © 2019 Bay Metals & Fabrication.